Unfortunately, this woman’s website isn’t in English. Fortunately – there is a translation available!! 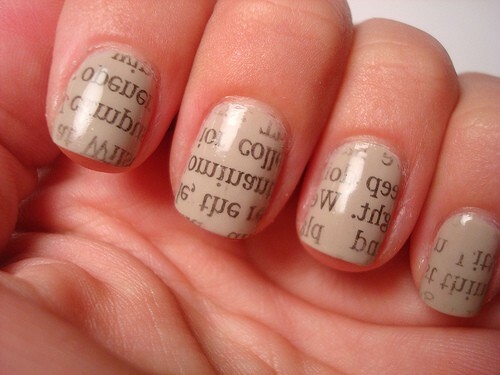 Want to get newspaper nails? Man, I wish I saw this BEFORE BLOGHER – I would have totally tried this out!!! Step 1: Paint your nails as usual and let dry. Step 2: Dip your nails in alcohol (vodka she says) and press a strip of newspaper on the whole nail. Step 4: Let dry and repaint top coat if desired. UPDATE: Another blogger is claiming this tutorial – so I want to give her credit as well. hey this is my tutorial, my nails and my photos ! please give me some credit!